Peaceful. Cheerful. Inviting. These are just three words that describe your experience when you choose to shop at our local floral boutique. Our friendly staff of talented designers are here to aid with the creation of blooms and blossoms for any occasion. We offer a full range of hand-picked inflorescence, including custom arrangements for weddings, sympathies and funerals; special occasions, corporate gifts, along with birthdays, a newborn, anniversaries, and more. 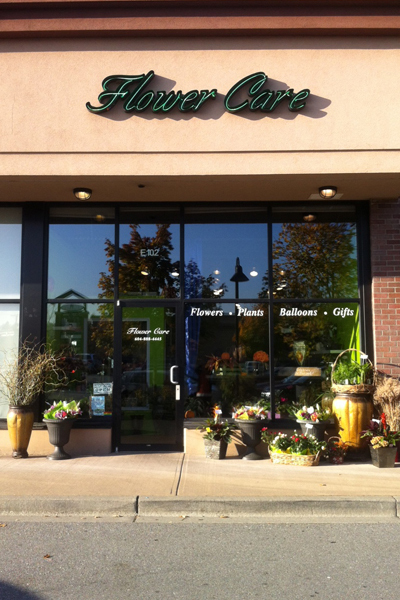 Walnut Grove Flower Care was launched in 1985, making our boutique the first florist in the up-and-coming neighbourhood of Walnut Grove. Linda Karpiuk purchased the store in 2011, and has since renamed it Walnut Grove Floral Boutique. Our emporium is a fresh, inviting space filled with flowerets, a selection of gifts, cards, home décor, and Davenport Peanut Brittle. Our location in the Thunderbird Village shopping district, and our proximity to Colossus Cineplex Odeon Theatre, enables us to deliver to all areas within Langley. Also serving Walnut Grove, Fort Langley and the surrounding areas including Surrey, Cloverdale, White Rock, Abbotsford, Maple Ridge and the rest of the Fraser Valley. We invite you to drop by the shop to speak with us personally, or order online now.